This P-51C-10-NT Mustang is serial number 43-25147. Built in 1943, its wartime service is unclear but it served with the Israeli air force after World War II, before joining the Israeli civilian registry. 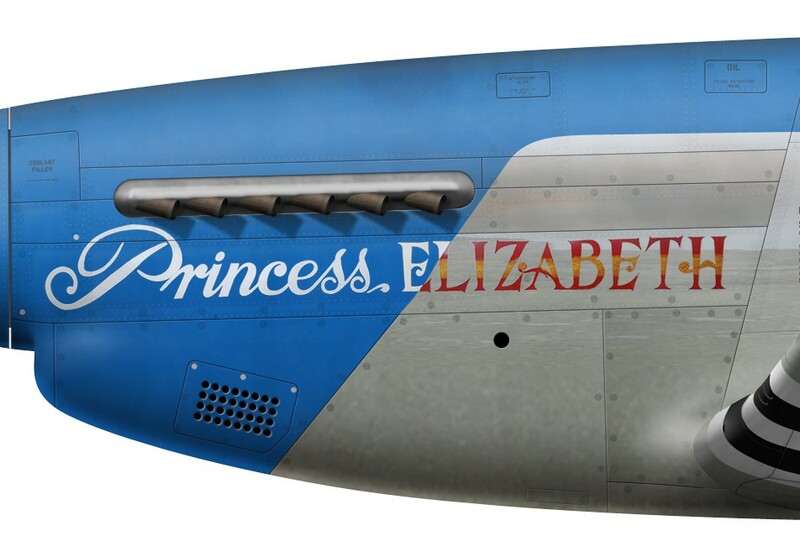 It is painted in the colours and markings of “Princess Elizabeth”, the P-51B flown by Lt William Whisner, a future 5.5-victory ace with the 487th Fighter Squadron, 352nd Fighter Group. It is said that Whisner never chose this name and nose art for his assigned aircraft. Instead, it was selected by John C. Meyer, the CO of the 352nd Fighter Group, who wanted to impress Princess Elizabeth when she came to visit the unit at Bodney and singled out Whisner’s aircraft as it was the only one not yet decorated or named. Whisner was reportedly less than happy with the name and media attention that resulted from this event. A complete history of this beautiful warbird can be found on the Crazy Horse Aviation Photography website.